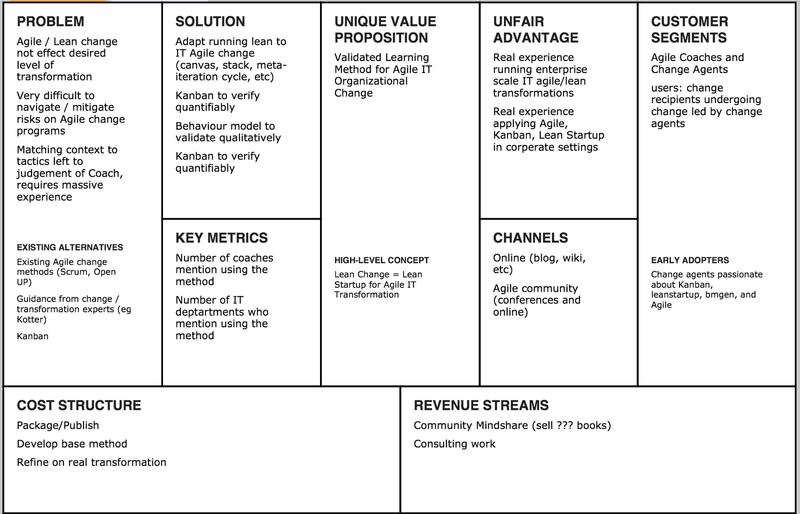 Lean Startup for Change is Dead! 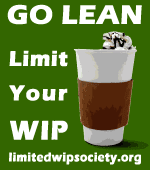 Long live Lean Change! Long Live the Lean Learning Machine! 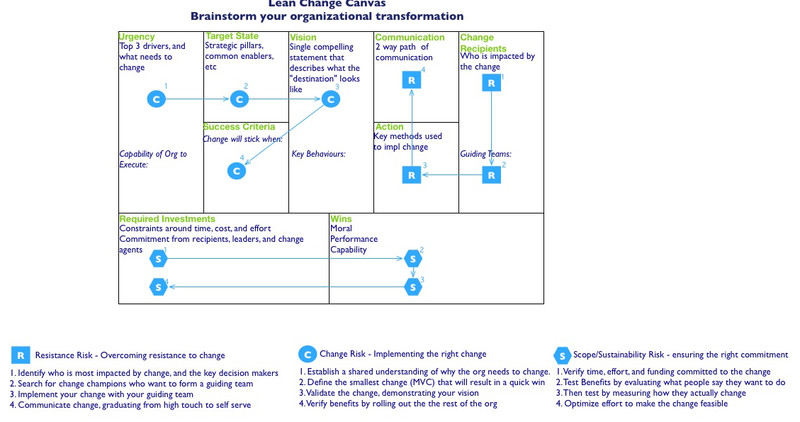 About 6 months ago I started experimenting with running IT Agile transformations using a new method dubbed by a few of us as Lean Startup 4 Change. The idea was to incrementally introduce change to an organization as a set of Minimum Viable Changes, taking advantage of validate learning, and preparing the client for pivot and pursue decisions. As of this time I still don't feel like we have achieved validated learning, ie being able to mitigate risk and accelerate learning while building a sustainable change. 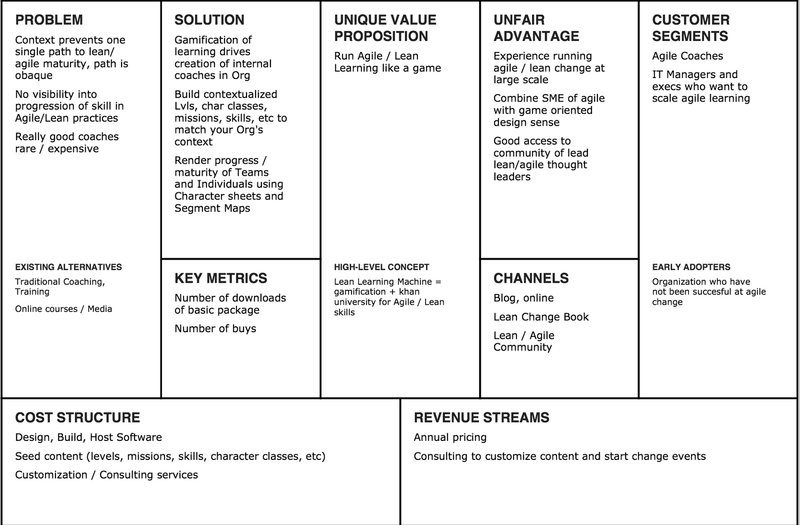 A part of the problem is that our lean startup 4 change method simply has to much stuff on it. (Gamification, Capability Models, etc). As of this point forward we are breaking the method into two distinct pieces that independently can be more faithful to their inspiration. First of all IT Organizational Change is not a startup, so the term Lean Startup 4 Change really doesn't make sense. Maximizing validated learning by focusing on what's minimally viable does still resonate as being vital to running a succesful change program. It seems that the underlying principles behind Lean Startup are applicable to any problem space with high uncertainty. 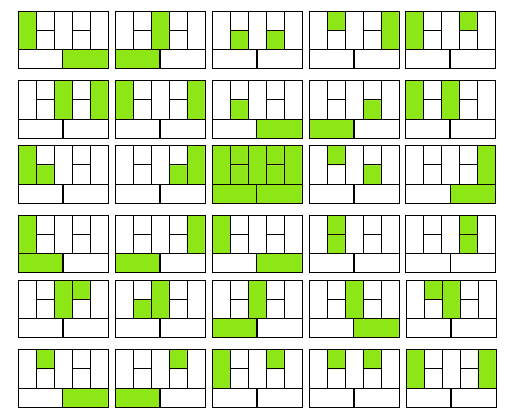 Lots of different problems could be handled better with a pivot or pursue, hypothoesis driven mindset. 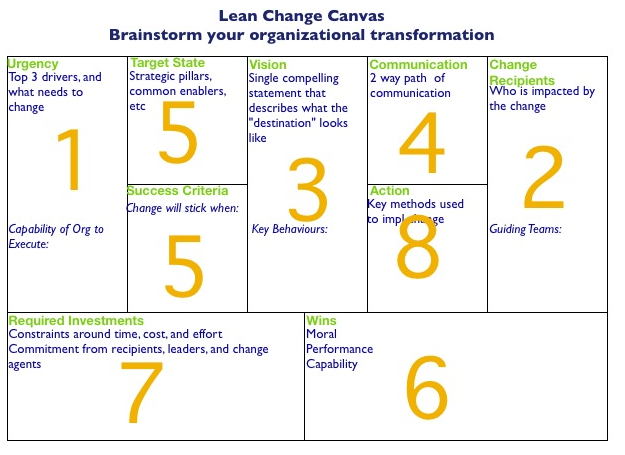 A method that helps change agents to maximize accelerated learning necessary to plan and execute a succesful Agile / Lean organizational change. 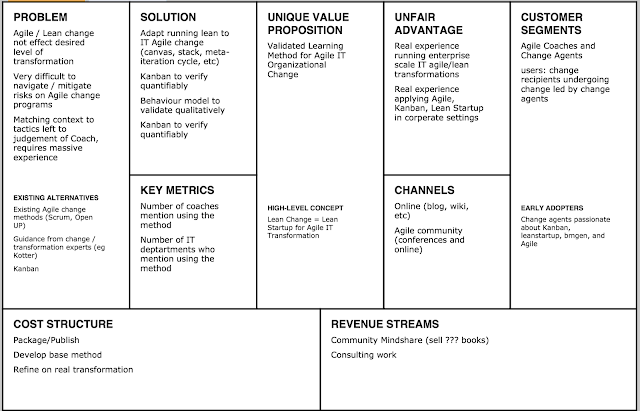 I am continuing to build Lean Change by abstracting pieces of the leanstartup framework into an an underlying set of meta components than tailoring those meta component to make them suitable for Agile change inititiatives. 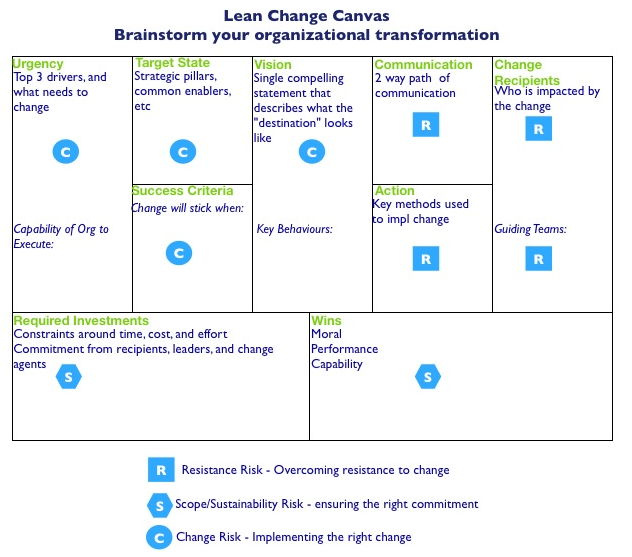 Example of these adapted components include creation of a Lean Change Canvas, and altering the meta-iteration life cycle into a Lean Change Meta- lifecycle. Up next is cataloging a sequential set of change risks along with some recommended strategies to coming up with Minimum Viable Changes and Minimum Viable Improvements that mitigate those risks. I should stress that these techniques are a port of the methods and tools that Ash Maurya has created as part of his Running Lean book and blog posts. His works are second to none when it comes to providing easy to understand advice on how to run a startup using lean methods, and I am finding it a pleasure to map these over the change world. 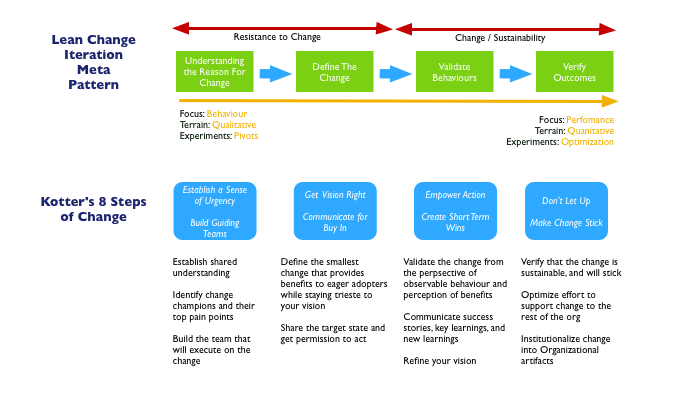 I am borrowing from classic change methods such as Kotter to come up with how the lifecycle can interact with the Canvas to test hypothesis relating to validating change drivers, getting the target state right, amd validating behaviour of change recipients is actually changing. I'm also workng with our firm's human capital practice to get their take. The role playing game style character sheets, levels, missions, characters classes, peer based learning, etc has been abstracted away from Lean Change. The Lean Learning Machine is a customizable agile learning engine that allows change agents to create an agile learning path and use game play to promote organizational self learning. The idea is that true agile change only happens when you no longer have to hire coaches, so we want to promote a coaching network, visualization of skill, and clarity around what to learn while respecting the fact that every change is different, and no two people wil advance the same way. 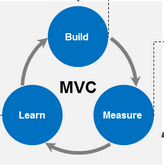 I think the most important change is that both of these projects will be developed using lean startup methods. 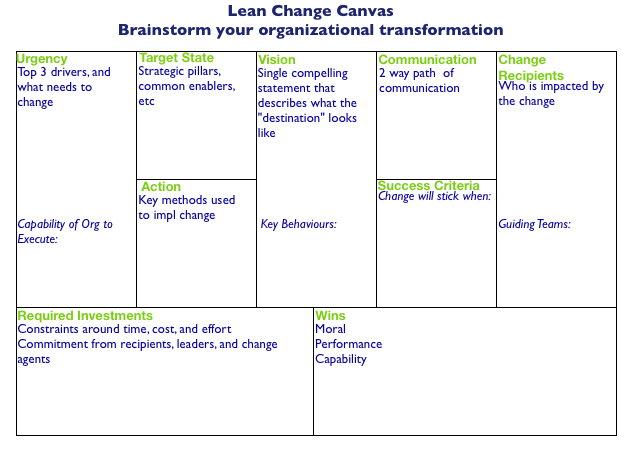 I'll be using Ash Mairya's Running Lean, as a process template. 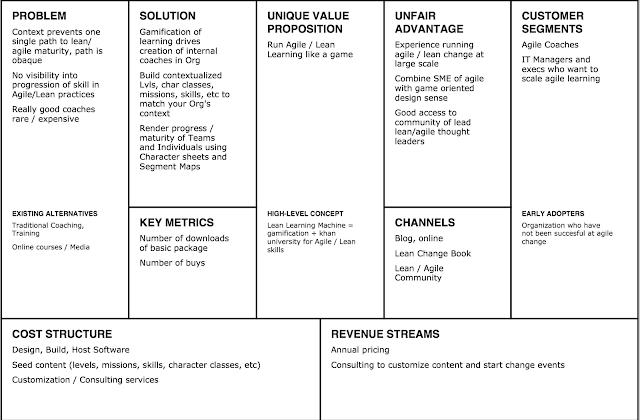 Here are the initial Lean Canvas below. Up next will be problem interviews where I hope to get my target customers (I think it's Agile Change Agents...) to tell me if this either of these are even a problem worth solving. Most Political TV adds go so past the point of pandering, that they insult the uneducated and educated alike. Canadians tend to get horrible service from telecommunication companies, bad airline experiences, and unsatisfying medical care. Americans seem to face a similar reality. Enterprise software seems to universally cause groans of dismay from the people that actually have to use it. Consultants continue to provide their customers with target states and roadmaps that seem largely divorced from the reality of implementation. Clients continue to ask for more of the same from consultants. So many aspects of our lives are contrained by a set of choices that are undifferentiated in their lack of ability to cause customer delight. Despite the heralded coming of the customer economy, a wealth of products and services are still push based. The provider decides on the thing to be built, and pushes a predetermined experience to the user. Customer feedback is completely mishandled, wether the reason is ignorance or incompetence is anyone's guess. As consumers, we try to make different choices, but still end up with more of the same. Certain organizations, mostly from the tech world, seem to excel at pleasing their customers. These companies focus on the best experience for their customer, and garner political will to chase after the best customer outcome. These companies have faith that profits will come from customer delight, and know that the reverse can never be true. What is preventing this customer experience revolution from moving faster in the corperate and public sector world? How do we accelerate the adoption of design thinking, synergistic methods, and the mantra of the modern knowledge worker into places like Health, Banks, Government, and Insurance providers?